I wait with curiosity to peek in your script! I do not know the English language. I use Google Translate. I hope it's all understandable. Hello, the screenshots look very nice! Could anyone please tell me how to get runway lightning like in the screenshots? Not possible yet. It's a work in progress. Okay thanks! Will this be added as a mod or in a release of Outerra? Cameni or Uriah will have to answer that one! 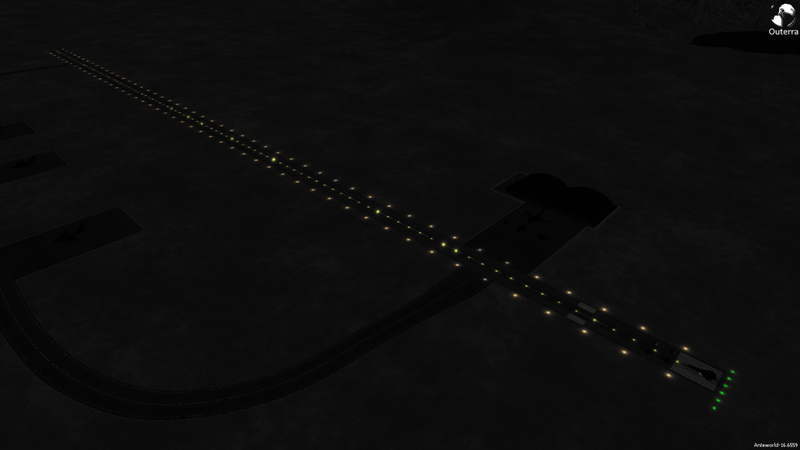 Regarding the runway lights, it is something I need to finish, and would be released as a mod until which time Outerra can implement an optimized runway lighting system integrated into the road system when a runway is built in the engine. I did design the script so that you can adjust the length, width, number of lights, and other properties easily by modifying a few parameters to make it fit different sized runways. 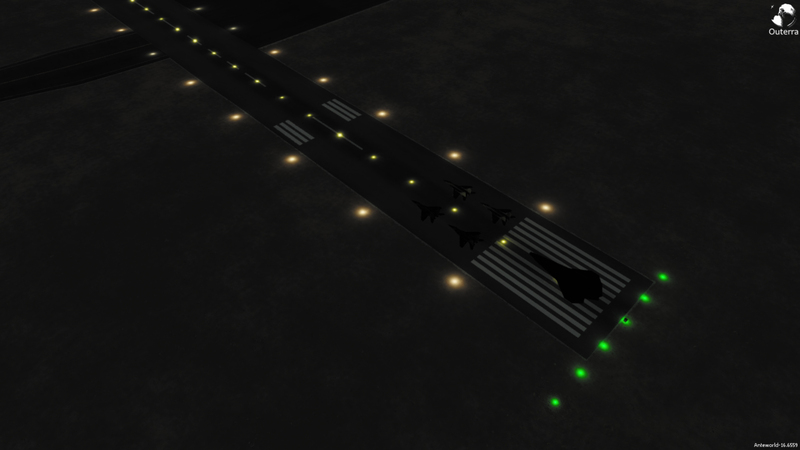 I have attached some screens of what the runway lights look like currently after some changes to the lights in Outerra made them look much better from a distance, which is really what I had been waiting for. I'll try to release the runway lights soon! I'm really looking forward for runway lights! I saw Outerra some time ago and yesterday I was so impressed by the development it made, that i bought it. Awesome man, welcome aboard! You really couldn't have joined at a better time! Hi! This looks great. Looking forward to these runway lights! Just got the Alpha yesterday, and very excited by all the changes from 2015. I work with a volunteer mod group called HoggitDev related to DCS. I was turned onto Outerra by one of our members, and this procedural driven environment, looks very nice. The performance for this engine seems far superior, so can't wait to see continuing evolution toward full fidelity flight sim, the work so far seems incredible! I just got on board yesterday, so pending IRL responsibilities, I can't wait to dig into the forums more, explore the existing work, and hopefully start contributing some aircraft models by my own hand! and hopefully start contributing some aircraft models by my own hand! "A man who is contented with what he has done, will never become famous for what he will do". 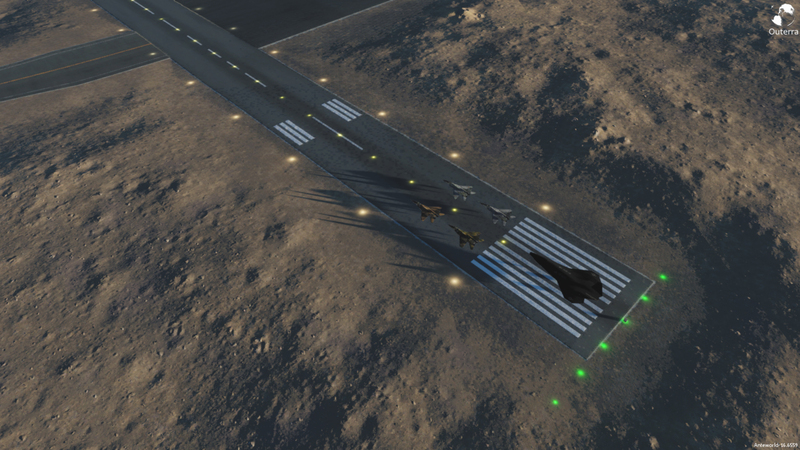 ... still to be seen, but it would be nice as an optional feature for the runway-building menu, just as, maybe in the future, street-lights at roadsides ? Yeah you are working on the A-4E Skyhawk with FarlanderMig for DCS right? He mentioned it somewhere here. I would love to see that bird in Outerra! Don't hesitate to post if you have any questions whatsoever! Many thanks! I'd love to get the A-4E into outerra, without question. Right now, we have our hands full trying to get all the pieces together just to make the Simple Flight Model work in-game. It's not a paid development, and I think that might be starting to wear the guys down a little bit, as they're having to balance IRL with the volunteering. Also, learning all these new skills, has led to everyone kind of dabbling on their own instead of pairing up to tackle difficult challenges in development. Add to the that the various degrees of OCD behavior, and you get the idea. A dozen direction, slowly crawling forward, or backwards in some cases ;P Really hoping to see things pick back up, but I'm broke myself, still got the Alpha of outerra, because I was researching procedural generation for about two weeks before Farlander dropped this in my lap, and $16 seems like a steal for planet Earth! Thanks again to Farlander for that, and I certainly will do everything in my power to utilize Outerra. It really seems like volunteer modding gigs are a huge time investment, so always looking for a creative way to add some financing, but I wanted to focus on teamwork first. Unfortunately sim pilots are fairly independent, and without fiscal incentive, I see IRL responsibilites tanking our critical mass. Even worse than toxic personalities, which come and go. Still, we started 2nd week in Janurary, and we've only just recently started to lose a little steam. I still think we'll have a strong update this month, and I look forward to getting a test model into Outerra to get some dirt on my hands!